Just last month, a Bentley Continental Supersports Convertible running Pirelli winter tires became the fastest car to drive on ice; reaching a top speed of 205.48 mph. That record however, would only last a few weeks thanks Nokian Tires and an Audi RS6. 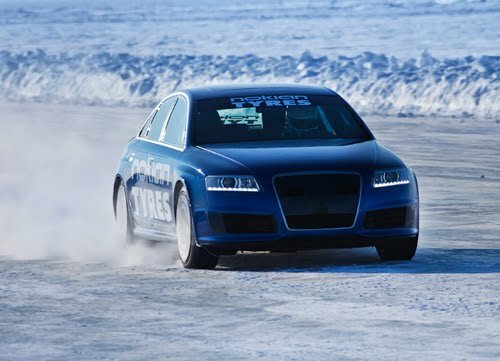 Strapping on a set of the company's Hakkapeliitta 7 studded snow tires, Nokian's Audi RS6 sedan managed to clock an astounding 331.61 km/h (206.05 mph), becoming the world's fastest car on ice. There was no word from Nokian concerning any modifications (excluding the visual aerodynamic enhancements) and/or horsepower figures of their RS6; but we imagine the car is pretty far from stock.